After purchasing bamboo pillow you need to take some extra care to last it long. There are different types of pillows in the market. Among all pillows, the bamboo pillow is not an exceptional pillow. You can wash this miracle bamboo pillow by hand or machine. You can follow our miracle bamboo pillow washing instructions presented below. A bamboo pillow consists of a bamboo cover and memory foam. A bamboo pillow has two covers for its memory foam. One cover is the outer cover which is made of bamboo fiber. The other cover is a normal cover which you find under the bamboo cover. This extra cover is used to arrange the memory foam properly in one place. You need to follow different washing instruction for the bamboo cover and the memory foam. 2.4 Air drying instruction for the pillow. 2.5 How many times your pillow should be washed. Every pillow has a care instruction label attached to it. After purchasing the pillow you need to read the care label properly. In the care label the manufacturer written clearly about how to take care of the pillow. Separate the bamboo cover from its memory foam. Wash them separately. As we know the bamboo cover is machine washable but memory foam is hand washable. Washing a bamboo cover by hand is not suggested by the expert, although you can wash the bamboo cover by hand. So, it is safe to wash it in a washing machine. 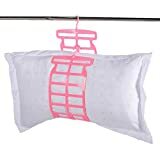 Pillow drying hanger or rack is very useful to dry out your pillow without losing its original shape. As I mentioned above, we need to remove the miracle bamboo pillow cover from the memory foam pillow and wash them separately. Memory foam should be washed by hand and bamboo pillow cover should be washed by the washing machine. If you do not have a washing machine, you can wash bamboo cover by hand also. After arranging all the above-mentioned things, you have to fill the bucket or basin with warm water. Do not use cold water or too hot water. The Fahrenheit level of Warm water is between 90 -110. The Celsius level should be between 30-40. Note: Both hot and cold water is bad for a bamboo pillow cover. Additionally, hot or cold water can ruin the bamboo cover as well as memory foam. Now is the time for adding mild detergent into the water. Two to three teaspoons of mild detergent should pour into the water for every pillow. Select the mild detergent . You are recommending you to use this all fresh clean laundry detergent to clean your bamboo pillow. this detergent will clean your pillow without destroying the pillow and it's memory foam. Wash whites, darks, and colors at any water temperature. 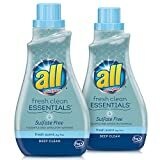 Safe to use in any washing machine and at any water temperature. This pack contains two 30-ounce bottles, enough for 46 loads. Now it is time to soak the pillow for 10-150 minutes into the soapy water. You should use your both hand in this soaking process. Try to give some gentle punch to the pillow. After soaking the pillow into the water, you need to rinse the pillow properly. Without proper rinse, some soap may remain into the memory foam of the pillow. And this unwashed soap is harmful to the pillow cover and the memory foam. Now the last and final step is drying the pillow in the sun heat or in the dryer.Place the pillows on the table or something like that to save them from ground dust. These are the general procedures for washing miracle bamboo pillow. As I mentioned above, there are two covers of a bamboo pillow. Between these two ones is a bamboo cover, which is the main cover of the bamboo pillow, and another is normal pillow cover, which is used to fill up the memory foam inside the pillow. Now, you need to wash separately the bamboo cover and the memory foam pillow. So, one of the major advantages of a bamboo pillow is, it is easily washable. Memory foam of bamboo pillow must wash by hand. Use a bucket or basin or small bathtub to wash the memory foam. Lukewarm to warm water is best for hand to wash the memory foam. Add 2/3 spoons of mild detergent to the water in a bucket or basin. Mixed the detergent with water. Soak the memory foam of the pillow into the soapy water. Do not soak your memory foam more than 20 minutes into the soapy water. Rinse out the bamboo pillow properly. Rinse out several times to remove the soapy water from the pillow totally. Remove the pillow outer covers. The only machine washes the bamboo cover. Select a gentle cycle to wash the bamboo cover. Do not wash the memory foam in the washing machine. Air drying instruction for the pillow. Put the pillow in the sun heat for air drying. If you do not have any types of drying rack or drying hanger, place the pillow on a clean table in the sun heat. That will fulfill your purpose. If you do not have any drying hanger, you should purchase it to get a better result. A drying hanger allows your pillow to get sun heat and air from all its side. It helps to dry out your pillow faster than any other options you have. Hang the pillow in the clothesline to dry in the sun heat. Additionally, it allows air circulation to the pillow. And air circulation increase the loftiness of the pillow. We are highly recommending Gizhome adjustable pillow drying rack to dry your pillow easily in the sun heat. You need to check the pillow occasionally to confirm the pillow is dried properly. A long time sun heat may fade the color of the pillow cover. Do not use the pillow before completely dry a wet pillow may hamper your sleeping. Additionally, A wet or damp pillow rise the chance of growing mildew.. Many people have different types of problems related to breathing. A moldy pillow increases the chance of asthma..
How many times your pillow should be washed. If your head sweat during sleeping, you need to wash your bamboo pillow once every month. If you have asthma or allergic problem, you have to wash your bamboo pillow once every two months. Because of sneezing the germs will spread all over the pillow. excessive washing may damage the bamboo fiber of the pillow cover. Additionally; excessive washing may damage the memory foam of the pillow.